Work conflict is risky. It can go bad and poison employee health, work relationships and organizational climates, or it can go well and help to energize problem solving, innovation and bottom-line effectiveness. Managing conflicts up and down the chain of command at work can be particularly treacherous, as power differences complicate conflicts and constrain response options. Organizations are rife with stories of executives and managers who abuse their power, of employees who overstep their authority, and of the resulting conflicts that can get stuck in downward spirals. 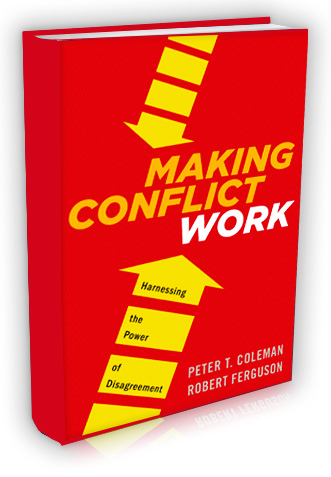 In Making Conflict Work, Dr. Peter Coleman explains why these pitfalls are so common and what to do to avoid them and to take full advantage of the energy and potential for change that accompanies them. It offers seven new strategies and dozens of tactics for increasing your Conflict Intelligence and finding greater success and satisfaction at work. Dr. Peter T. Coleman holds a Ph.D. in Social-Organizational Psychology from Columbia University. He is Professor of Psychology and Education at Columbia University where he holds a joint-appointment at Teachers College and The Earth Institute and teaches courses in Conflict Resolution, Social Psychology, and Social Science Research. Dr. Coleman is Director of the Morton Deutsch International Center for Cooperation and Conflict Resolution (MD-ICCCR) at Teachers College, Columbia University and Executive Director of Columbia University’s Advanced Consortium on Cooperation, Conflict, and Complexity (AC4). He currently conducts research on optimality of motivational dynamics in conflict, power asymmetries and conflict, intractable conflict, multicultural conflict, justice and conflict, environmental conflict, mediation dynamics, and sustainable peace. In 2003, he became the first recipient of the Early Career Award from the American Psychological Association (APA), Division 48: Society for the Study of Peace, Conflict, and Violence, and in 2015 was awarded the Morton Deutsch Conflict Resolution Award by APA. Dr. Coleman edits the award-winning Handbook of Conflict Resolution: Theory and Practice (2000; 2006; 2014) and his other books include The Five Percent: Finding Solutions to Seemingly Impossible Conflicts (2011); Conflict, Justice, and Interdependence: The Legacy of Morton Deutsch (2011), Psychological Components of Sustainable Peace (2012), and Attracted to Conflict: Dynamic Foundations of Destructive Social Relations (2013). 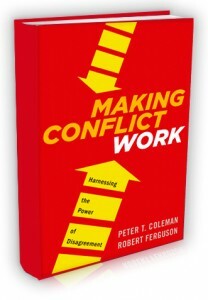 His most recent book is Making Conflict Work: Navigating Disagreement Up and Down Your Organization (2014). He has also authored over 80 journal articles and chapters, is a member of the United Nation Mediation Support Unit’s Academic Advisory Council, is a founding board member of the Leymah Gbowee Peace Foundation USA, and is a New York State certified mediator and experienced consultant.